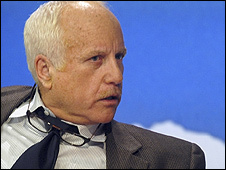 Actor Richard Dreyfuss is suing his father and uncle over a 24-year-old loan he claims was never repaid. The Jaws star, 60, says he gave his relatives $870,000 (£453,000) in 1984 when they owned an interest in a Los Angeles office building. In court papers filed on Friday, he claims the loan is still outstanding and that his uncle, Gilbert, has refused to turn over financial records. Neither Norman nor Gilbert Dreyfuss could be reached for comment. The actor is seeking repayment of the loan, plus interest and punitive damages. Dreyfuss became a Hollywood star in the mid-1970s, appearing in Close Encounters of the Third Kind and winning a best actor Oscar for The Goodbye Girl in 1978. After a publicised drug problem, he re-established himself in the 1980s with roles in Down and Out in Beverly Hills, Stand By Me and Nuts. He claimed in 2004 that he was no longer interested in making movies, but has since appeared in disaster remake The Poseidon Adventure and will soon be seen in romantic comedy My Life In Ruins.